Blue Ivy Carter celebrated her second birthday like a princess. It was a birthday affair fit for princess. Beyoncé and husband Jay-Z threw their daughter, Blue Ivy, a princess themed 2nd birthday party last week. The power couple rented out an entire theme park for the day. Reports say Beyoncé and Jay-Z hosted the party at the Miami wildlife habitat and botanical garden Jungle Island. 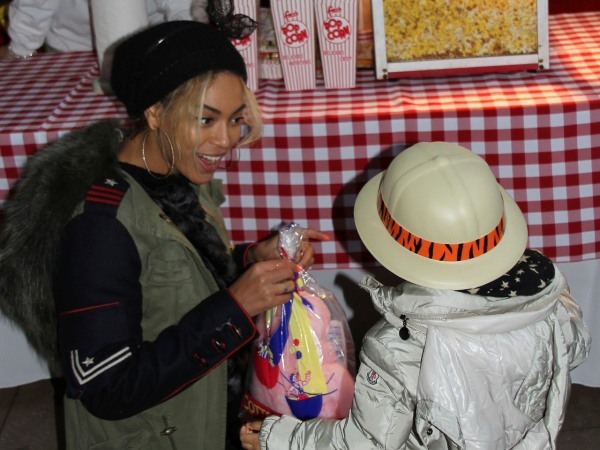 Beyoncé recently shared photos of Blue’s party on her blog. Cute little Blue wore a “birthday girl” tiara and had her face painted with her guests. The guest list included Beyoncé’s besties and fellow Destiny’s Child group members, Kelly Rowland and Michelle Williams, who also had butterflies painted on their faces. Beyoncé looked like she had a lot fun at the party as she posed with a 10-foot albino python wrapped around her neck. She also kissed a monkey and bond with a tiger. Mr and Mrs Carter just showed the world how to throw a birthday party.